The notion of well-posednes of a fixed point problem has generated much interest to a several mathematicians, for examples, F.S. De Blassi and J. Myjak (1989), S. Reich and A. J. Zaslavski (2001), B. K. Lahiri and P. Das (2005). 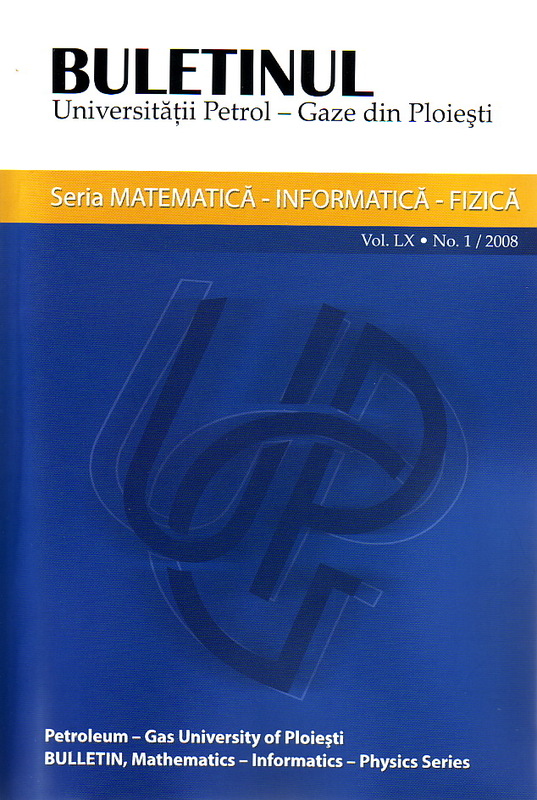 Also, in 2003, V. Popa introduced some fixed point theorems for mappings satisfying a new type of implicit relation. The purpose of this paper is to prove for mappings satisfying a new type of implicit relation in a compact metric space, that fixed point problem is well-posed. Ce travail est la continuation du travail pr�c�dent (I) o� nous avons introduit la classe des fonction faiblement pr�ouvertes dans les espaces bitopologiques flous et nous avons d�montr� quelques th�or�mes de caract�risation pour ces fonctions. Dans ce travail nous introduirons aussi et autres formes d�ouverture dans les espaces bitopologiques flous et nous �tablirons quelques implications importantes. Mais les plus importantes r�sultats de ce travail sont les �quivalences parmi les concepts d�finis pour les cas des espaces bitopologiques flous particuliers, mais tr�s importants. We gather here seven definitions of a Gelfand-Shilov-Roumieu space of rapidly decreasing functions as an inductive limit of a directed family of Banach spaces. We prove that all the inductive limit topologies defined are the same: they do not depend on the directed family we use for the definition of the Gelfand-Shilov-Roumieu space. The paper  introduces Rychlewich�s notion of upper/lower almost nearly quasicontinous multifunction as a generalization of upper/lower almost quasicontinous multifunction  and upper/lower nearly continuous multifunctions . The purpose of our paper is to obtain new theorems of characterization for upper/lower almost nearly quasicontinuous multifunctions. Dans cet ouvrage on pr�sente les bases scientifiques et religieuses pour le calcul des dates des P�ques. On y trouve la signification des F�tes des P�ques, la r�gle de calcul du jour de la P�que, la description des calendriers utilis�s depuis l�antiquit� jusqu'� pr�sent et leurs retards actuels, les recommandations du Concile Mondial des �glises et aussi des scientifiques pour revenir � l�exactitude initiale, l�analyse compar�e des r�sultats du calcul des dates des P�ques catholiques, orthodoxes et juives dans l�intervalle des ann�es 2001-2030 et, finalement, les conclusions pour pouvoir arriver � �tablir une date unique pour le temps de la P�que des chr�tiens. We present here our overview of the most well-known and used desktop grid systems that can be used to scavenge cycles from idle desktop computers either from a local network or from Internet: SETI@home-BOINC, distributed.net, PVM, Entropia, and Condor. This overview could be used also as a guide to choose the most appropriate desktop grid platform to solve a particular problem. Association rule mining represents a data mining technique and its goal is to find interesting association or correlation relationships among a large set of data items. With massive amounts of data continuously being collected and stored in databases, many companies are becoming interested in mining association rules from their databases to increase their profits. For example, the discovery of interesting association relationships among huge amounts of business transaction records can help catalog design, crossmarketing, loss leader analysis, and other business decision making processes. A typical example of association rule mining is market basket analysis. This process analyzes customer buying habits by finding associations between the different items that customers place in their �shopping baskets". For accomplish a good analysis of the imense volumes of data, it is neccesary the usage of some powerful instruments. In this paper, are presented some features of SAS software and an example of utilizing this software for solving a certain problem from the social domain. This software is a comprehensive package with very powerful data management tools, a wide variety of statistical analysis and a batch of graphical procedures. This article describes the basic steps which may be followed in building an intelligent agents-based system, from its analysis and design to the implementation and running system. These steps are followed out to create such a system using Zeus, a specific software. The system, called AgentAirPol, is targeted at the environment protection domain, especially to the industrial activity and its effects on the athmosphere. It has been designed for a careful tracing of the air pollution rate produced by an industrial plant. This paper aims at obtaining exact analytical solutions for the flow over an oscillating disk in the presence of partial slip and a porous medium. Some flow generated by certain special oscillation is also included in each case. The research have found that the velocity profile is of the wave nature and that amplitude of the wave decreases when the partial slip parameter increases. This issue deals with inducing of alignment (orientation) in polymer films under centrifugal field. The new method consists in the film sedimentation on an inner side cylinder in rotation with fixed rotations per minute. Simultaneous application of centrifuge fields and thermal treatments induces transformations in preferential directions. The behaviour of orientation-induced by crystallization of PE (polyethylene) films from the thermal treatment in centrifugal field has been investigated. The orientation induced in this way was monitored by polarized IR spectroscopy and XRD. This paper aims at demonstrating how we can obtain a dependency between pressure drop and other mixtures flows characteristic parameters (loss coefficient, dynamic viscosity) and we analyze this dependency numerically with concrete data from mixture transport in porous pipelines. The volume flow difference is generated by a corrosion crevice on pipe. The loss coefficient is calculated from a fraction of outlet flow and inlet flow. These results are represented on 2D and 3D graphics. Cylindrical nantube-like structures are obtained by three-dimensional extruding of specific cut off area from a plane (bidimensional structure). If in case of planar graphenic structure the elementary cell contain two carbon atoms, in our case we propose the existence of one such type of atom. The present paper confirm the existence of a plane structures, other then hexagonal ones, which lead to formation of cylindrical one-wall structures (SWNT-like).